TOKYO -- Mazda Motor Corp., Japan's least profitable major carmaker, fell in Tokyo trading today after saying it may raise a record 162.8 billion yen ($2 billion) selling new stock. Mazda dropped 6.8 percent to 137 yen. The company said Wednesday it plans to increase shares and take out a loan after forecasting its biggest annual loss in 11 years. Selling as many as 1.22 billion new shares would boost the number of its outstanding shares by almost 70 percent, Mazda said. The nation's most export-reliant carmaker is bracing for a 100 billion yen annual loss after the yen appreciated against all major currencies during 2011, which has also driven down earnings at Toyota Motor Corp. and Honda Motor Co. The proceeds may help the company avoid a debt-rating downgrade and allow Mazda to fund overseas factories needed to reduce its vulnerability to the Japanese currency. "The company needs to speed up overseas expansion, partly because its reliance on exports drove the company into its situation," Mitsuo Shimizu, a Tokyo-based analyst at Cosmo Securities Co., said on Wednesday. "It's going to take some time to evaluate whether the sale was the right decision." A sale of 1.22 billion shares to raise 162.8 billion yen equates to a per-share price of about 133 yen, or almost 10 percent lower than the last close. The maximum value of the sale, scheduled for pricing as early as March 5, is equivalent to 62 percent of Mazda's market capitalization yesterday. Shimizu said the scale of the stock sale is bigger than expected. The stock, the worst performer last year among major Japanese carmakers, continues to underperform rivals in 2012. Mazda on Feb. 21 dropped 9.9 percent, the most in almost a year, after broadcaster NHK reported the company was preparing to raise as much as 100 billion yen through a capital increase. The sale may reduce the risk of a credit-rating downgrade that would raise borrowing costs for a company already saddled with about 60 percent more debt than equity, a level of indebtedness second only to Mitsubishi Motors Corp. among Japan's eight biggest automakers, according to data compiled by Bloomberg. 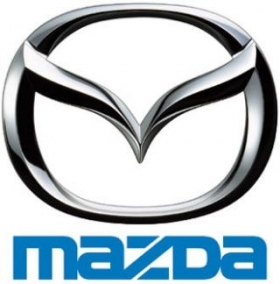 Japan's Rating & Investment Information Inc. on Feb. 2 said it may cut Mazda's rating of BBB, which is two levels above junk, after five quarters of losses eroded the company's equity -- also known as book value -- to less than 20 percent of assets. Mazda's debt isn't rated by Standard & Poor's and Moody's Investors Service. The proportion of stockholder's equity relative to total assets is among the most important measures determining company's credit rating, according to R&I's website. While a capital increase is positive for Mazda's creditworthiness, it isn't the only measure to gauge the company's ability to generate cash, said Jun Tanaka, chief analyst at R&I in Tokyo. The share sale announcement came less than a month after Mazda President Takashi Yamanouchi told reporters in Tokyo during the company's earnings presentation that repairing Mazda's capital "is a must" and that the company was weighing its options to boost capital. Mazda on Feb. 2 widened its full-year loss forecast, citing the growing "financial instability" in Europe and shortfalls from last year's floods in Thailand among reasons for the company to lower its projections. Mazda's Yamanouchi said then he's confident the company would return to profitability next fiscal year, an expectation not shared by CLSA Asia-Pacific Markets, which expects Mazda to post losses through the year ending March 2014. Mazda has posted losses partly because of its vulnerability to the yen, which has appreciated against all major currencies in the past two years. To reduce the currency risk, Mazda plans to increase its portion of overseas production to 50 percent by March 2016 from about 30 percent now. The company is also counting on its Skyactiv technology -- designed to improve fuel efficiency, driving performance and reducing production costs -- to help revive profits. Mazda plans to use the proceeds from the fundraising on projects such as a new factory in Mexico and in its Skyactiv technology. On Feb. 16, Yamanouchi said the company was in talks to form an alliance, though he ruled out the discussions would lead to the purchase of equity. He also ruled out forming another partnership involving a capital tie-up because of Mazda's existing relations with Ford Motor Co.
Ford still owns 3.5 percent of the Japanese company after reducing its stake from more than 33 percent.